I came back from the Ranch a few weeks ago and it is only now that I am realizing how this experience has had a major impact on my life. I spent an extraordinary summer working at the Ranch, which is certainly the first of many experiences of plenty more future travels to come all around the world. My name is Salomé, I am 20 years old and I am living in France. Just after high-school I decided to start medical studies. I didn’t really take the time to think about what I really wanted to do in my life. In fact, after one year of hard work I stopped because it was just not for me. After that, in October 2015 I was a little bit lost, but the only thing that I was sure to do during this year off was to do a kind of woofing job in another country, far away from my routine. I was looking on the Internet and finally I found the website of Chilcotin Holiday's Ranch. Two things attracted me right away: the Canadian wilderness, a dream destination for most Europeans, and the idea to work with horses. Few days after this discovery I was exchanging emails with the Ranch and a few weeks after that I was ready to leave my home to do a 2 Weeks Guide School Training course and maybe to stay there all summer! Arriving at the Ranch, everything was going so fast! I was trying to understand people and to speak English, as well as learn how to saddle, to shoe, to pack, to hobble and to stake a horse, to meet plenty of new people and try to memorize all the vocabulary in relation to the Ranch. I remember that my brain was working non-stop! The Guide School was an incredible experience. I met great people, students and teachers, but most importantly, these two weeks taught me all I needed to know to be a Guide. Fortunately for me, one week after the Guide School, I already had the responsibility of guests! So, during the next three months, my ‘main job’ was to guide guests. There were two kinds of guiding; guiding people for a few hours around the ranch or guiding a group to a camp in the Alpine and ride around there for a few days. Behind the word ‘guiding’, there are a lot of things to do, not only riding and showing the trails to the guests. When we were up at Spruce Lake or Eldorado Camp, we had to cook on the fire, to take care of the horses, bring them up to the meadow during the night, organize the camp and much more. 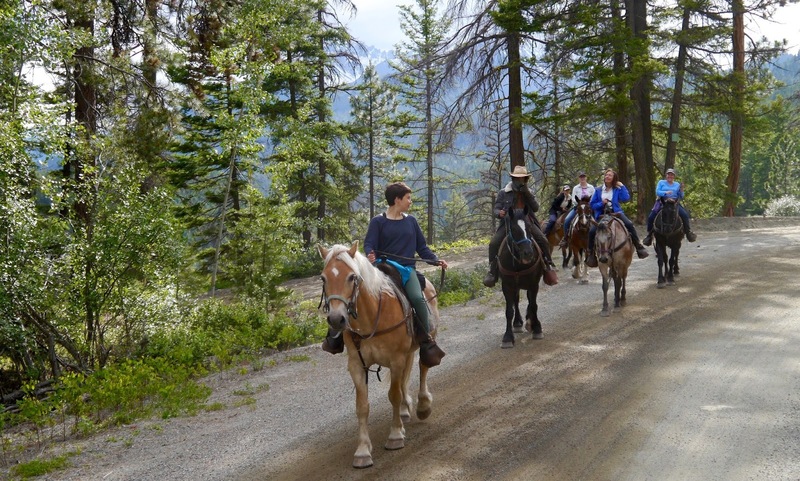 That was a lot of work, but it was absolutely rewarding by being with our sweet horses and with interesting plus helpful guests in the middle of the mountains. I will never forget these challenging, intense and precious moments spent up there. When I was not guiding I was staying at the Ranch, cooking for the guests and for the staff, cleaning, taking care of the chickens and all of the horses or even doing some maintenance work. Cooking for many was one of the most exhausting jobs, but also a great demonstration of team work and of mutual support in the most difficult moments! During my days off I was riding ( I missed that very quickly), going to Pearson’s Pond with some passionate fishermen, helping people out or just spending funny times with friends. More unusual I went twice to a Powwow, a First Nations event, and once hiking to Brett Camp, one of the most beautiful camps in the Shulaps mountains. I am so proud of what I did, of what WE did all together, as staff and guests. Living there is not easy. Everyday, you require a lot of energy, rigor and motivation, but all summer, a simple fact stayed in my mind: we all have great resources, even if we can’t see it on the first time. I am a city girl, I never thought that I would survive in this kind of environment, working so hard and not even in my language. But here I was, working and enjoying my life at the Ranch for almost 4 months! Of course, this kind of life doesn't suit everyone, but if you want to do something different and if you are ready to involve yourself in as much as you can while respecting yourself, this place is definitely for you. Back in France my head is full of new ideas for my future. Finally, if I learned something from the Ranch, it is that I really want to be the master of my own destiny and I will! Thank you, Chilcotin Holidays Team 2016 and thanks to all my wonderful guests who made me feel so good!